Known as the Gamecock City, Sumter lies near the geographic center of the state of South Carolina at 33°55′37″N 80°21′49″W (33.926942, −80.363541). Sumter is 100 miles west of Myrtle Beach's Grand Strand and 175 miles east of the Blue Ridge Mountains. 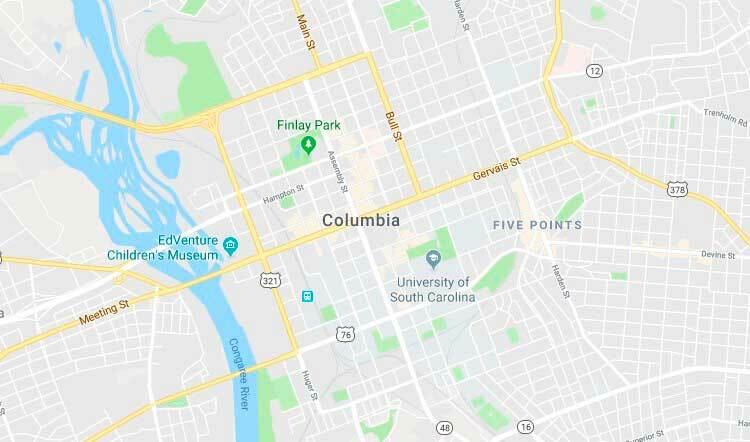 Columbia, the state capital, lies approximately 45 miles to the west, and Charleston is approximately 100 miles to the south. According to the United States Census Bureau, the city has a total area of 26.8 square miles (69.3 km²), of which 26.6 square miles (68.9 km²) is land and 0.2 square mile (0.4 km²) (0.60%) is water. As of the census of 2000, there were 39,643 people, 14,564 households, and 10,049 families residing in the city. The population density was 575.6/km² (1,491.2/mi²). There were 16,032 housing units at an average density of 232.8/km² (603.0/mi²). The racial makeup of the city was 69.58% White, 26.31% African American, 0.23% Native American, 1.27% Asian, 0.07% Pacific Islander, 1.12% from other races, and 1.41% from two or more races. Hispanic or Latino of any race were 2.37% of the population. There were 14,564 households out of which 35.6% had children under the age of 18 living with them, 46.0% were married couples living together, 19.3% had a female householder with no husband present, and 31.0% were non-families. 27.3% of all households were made up of individuals and 11.7% had someone living alone who was 65 years of age or older. The average household size was 2.57 and the average family size was 3.14.